2. The Catechism of the Catholic Church states that sacramentals such as the Brown Scapular "do not confer the grace of the Holy Spirit in the way that the sacraments do, but by the Church's prayer, they prepare us to receive grace and dispose us to cooperate with it." 3. According to the Vatican's Congregation for Divine Worship, the Brown Scapular is "an external sign of the filial relationship established between the Blessed Virgin Mary, Mother and Queen of Mount Carmel, and the faithful who entrust themselves totally to her protection, who have recourse to her maternal intercession, who are mindful of the primacy of the spiritual life and the need for prayer." 4. 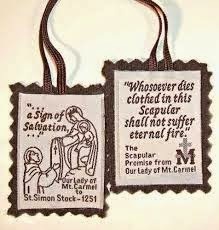 The scapular must consist of two pieces of brown cloth with one segment hanging on the wearer's chest, and the other hanging on his/her back. These pieces are joined by two straps or strings which overlap each shoulder—hence the word "scapular" (shoulder blade). 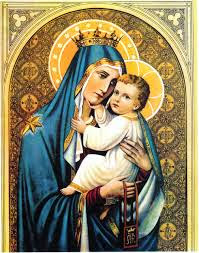 Images sewn onto the Brown Scapular are unnecessary. In the past the scapular was required to be 100% wool but this is no longer required. 5. Any Catholic priest may invest a baptised Catholic with the Brown Scapular. Lay people are unable to bless a Scapular. The most recent Rite for the Blessing of and Enrollment in the Scapular, approved in 1996 by the Congregation for Divine Worship and the Discipline of the Sacraments, is available in booklet form, the "Catechesis and Ritual for the Scapular of Our Lady of Mount Carmel".